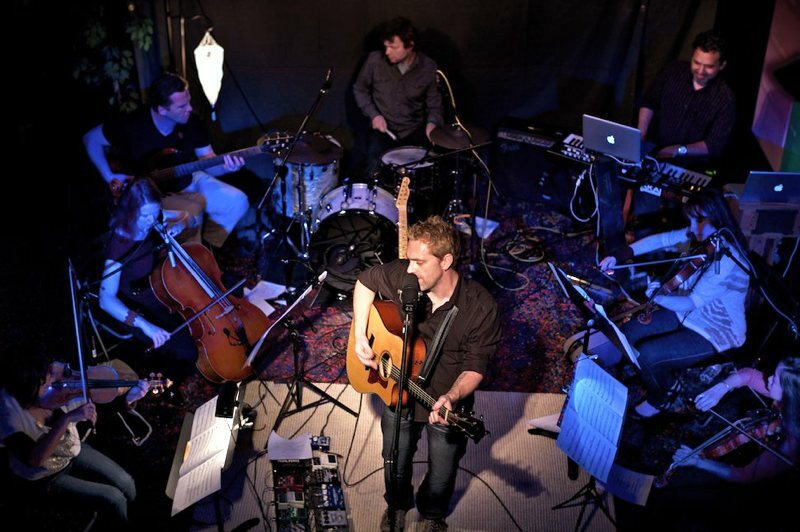 On April 5th and 6th, 2011, I arranged strings and then played keyboards as musical director for singer, songwriter, and guitarist Troy MacCubbin to put on two shows at the Fake Gallery in Los Angeles. Troy’s music is a blend of pop and rock with a blues/country influence, and it was a joy to work with the veteran string quartet Thread (Songa Lee, Lisa Liu, Ginger Murphy, and Caroline Buckman), who between them have played with everyone in the industry from James Taylor, Peter Gabriel, Paul McCartney, and hundreds of other artists. Rounding out the rhythm section was the extremely capable Danish drummer Jesper Kristensen on drums and Al Slavik on bass. The concept was to take a pop/rock show and add some unique elements to make it a very special night, hence the addition of the string quartet and the vibe of the art gallery, owned and graciously opened to us by independent artist Paul Kozlowski. To get the show ready, we began with Troy’s rough guitar/vocal demos of each song. I worked on string arrangements and sent mockups using sampled strings to Troy via e-mail for his approval, and after we were both satisfied with them, the arrangements went to a copyist for layout and then we headed straight into string quartet rehearsals to iron out the intricacies of the string parts. The rhythm section rehearsed independently, and because of time constraints, we were only able to bring the entire ensemble together a couple of hours before the first performance for a quick run-through before showtime.